Optimization of the soft tissue support and gingival contour with immediate implant and natural provisionalization. A 34-year-old female patient presented to our practice complaining of mobility of the maxillary right central incisor. Clinical examination indicated that the symptoms were due to a subgingival horizontal fracture of the root. Radiographic evaluation showed a radiolucent lesion in the periapical area. The subgingival root fracture was confirmed during periodontal examination (probing), and eventually, by cone beam computed tomography (CBCT). Based on the diagnosis and due to the fact that the root was short, it was contraindicated the treatment with orthodontic traction. The best option for the treatment planning was extraction of the tooth followed by immediate implant placement. The surgery comprehended a placement of an implant (NobelActive Internal NP 3.5x13mm, Nobel Biocare) in its ideal 3D position and gap (between implant and the socket wall) filling with anorganic bovine bone matrix (Bio-Oss Collagen, Geistlich). A subepithelial connective tissue graft was placed and stabilized by a double suture. Subsequently, the immediate screw-retained provisional was made by using the patient’s natural tooth crown. The final impression was taken after 4 months using a customized impression post, allowing a precisely copy of the original gingival design. A CAD/CAD composite replica was milled based on the contralateral tooth in order to fabricate an index that would reproduce the gingival margin contour. By using a round diamond bur, the adequate emergence profile (critical and subcritical contours) was created for the final restoration. The final zirconia abutment was milled to be luted onto a Ti-base. Ceramic layering (Noritake CZR) was performed and a try-in in situ was conducted to evaluate esthetic outcome, such as enamel characteristics and gingival zenith before finishing with last layering. 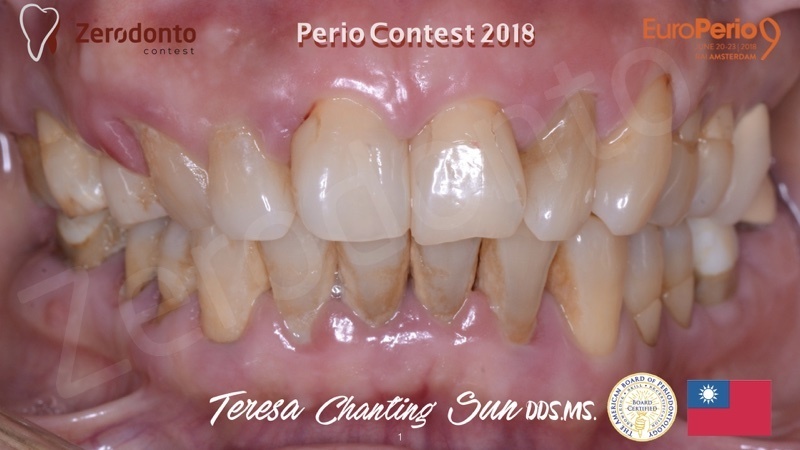 After completion, the final ceramic crown was luted to the Ti-base using a MDP containing luting resin (Panavia F, Kuraray Co) and primer agent (Alloy Primer, Kuraray Co). Conclusion: The clinical outcome of anterior implant restorations is directly associated with the soft tissue management during surgery, but also with the immediate provisional recording of the natural gingival contour. Van Dooren E, Soares C, Bocabella L, Clavijo W, Clavijo V. Analog protocol for obtaining the ideal soft tissue support and contour in anterior implant restorations. Quintessence Dent Technol. 2016;39:37-46. Soares C, Soares LM, Duarte GF, Sartori N. Maintaining the esthetics of anterior teeth with a flapless single-tooth immediate implant placement. Quintessence Dent Technol. 2015;38:113-125.